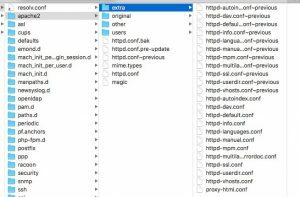 If your previous Apache setup stopped working after updating to MacOS High Sierra, then this post should be useful for you. On every update of the MacOS it ships with its own version of Apache and PHP and creates a new install that overrides your configuration. The way the Apache is structured is you have a main file httpd.conf on the main apache2 folder and then you have an extra folder that holds specific configuration. Creates a backup of the httpd.conf file as httpd.conf-previous. The httpd.conf most of the times remains the same, but the files in extra folder are overriden. I recommend you merge the changes instead of overriding the extra files. If you have XCode installed, it comes with a nifty comparison tool called FileMerge. If you don’t have Xcode you can grab it for free at the App Store. You can use the terminal editor like vi or nano to make the changes. Or you can use an external text editor. And that should fix the issue. I’ve made a Youtube video of the steps in my How To channel if you want to watch the steps in action.